Irrespective of the web browser you use, sometimes you might see that without your knowledge your web browser has switched from Google.com to a country specific Google homepage such as Google.ca . You may ask what’s the difference between these two domains, aren’t they the same? Well, Google has Country specific homepages for every country with the respective top level domains extension such as Google.co.in for India, Google.ca for Google Canada and so on. If you try searching for a same query on different country specific Google search homepages, you will find out that the search results will vary across all the Google search results. By default, whenever you access Google search, Google will automatically redirect you to your country specific Google search engine. Once you are on a country specific Google search engine, no matter how many times you try to access Google.com by entering the URL in your browser, you will always be redirected to the country specific Google search homepage. So in a situation like this, how will you set Google.com as your default search engine. Method 1: The solution is present in front of you all the time but its somewhat difficult to notice. If you take a look at the bottom right corner of Google search, you will find that there is a link to Google.com. 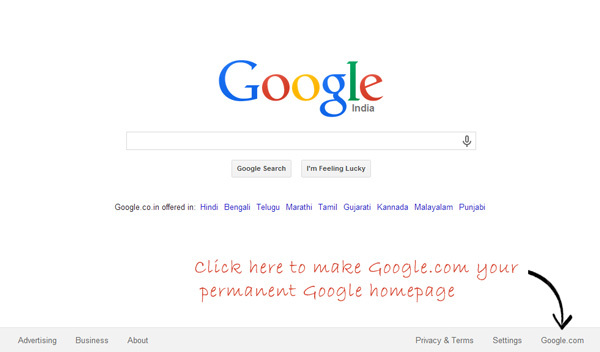 Click on it and you will be redirected to Google.com and henceforth Google.com will become your default search engine. Follow the process once again and you can easily switch back to your regional Google search engine. Method 2: There’s another easy way to access Google.com without being redirected to your country specific Google homepage. Simply click on this link : http://www.google.com/ncr and you would be taken to Google.com without any redirection.